Nepal Thanks You The Sherpa Foundation would like to extend our sincere appreciation to Sara, Travis, Kaela and Deagen Fahrney for traveling all the way to Nepal to volunteer. They helped built houses for the victims of an earthquake and underprivileged families in the Everest region of Nepal. Also thank you to Jan, Rosi, Lani, Mary and Colleen for trekking to Everest Base Camp to help the local economy directly. We hope everyone had a wonderful time in Nepal being with local Sherpas and experiencing many cultural and ritual events. 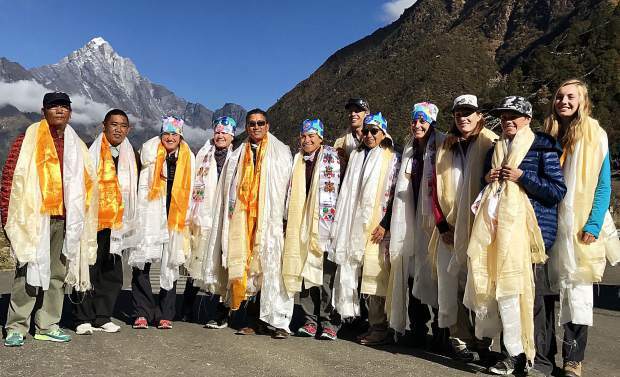 Anyone who may be interested in trekking in Nepal with the Sherpa Foundation for direct impact to the local economy, please contact Pemba Tenzing Sherpa via Pemba@SherpaFoundation.org for the upcoming Customized Cultural Trek to Everest Base Camp in November. More information about Sherpa Foundation's mission and work progress can be found online by visiting www.SherpaFoundation.org or facebook.com/SherpaFoundation.